Celebrity Extra: What made you decide that now was the time to write a beauty book? 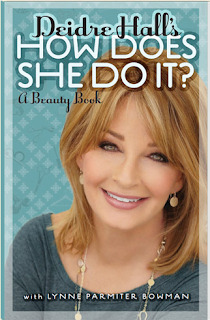 Deidre Hall: Lynne and I wrote “Kitchen Closeup,” and that was fun. But what I know is beauty. It seemed a little bit daunting at the time, writing up a beauty book, but then it just all really came together, and that was it. I figured, I’ve done 35 years in front of a camera, so, if I haven’t learned a thing or two about beauty, then I should just pack up my tent. CE: You collaborated with Lynne to write this book — how did your partnership in writing come about? DH: It doesn’t feel like working with her, and that’s the truth. We talked earlier about having spent so much time together [while working on “Kitchen Closeup”] sitting around the kitchen table and her stirring and me writing, or her writing and me stirring. We’ve shared these kinds of health issues and food issues for so long that it was natural to write that book. And then it was natural to write the beauty book, because we also spent that amount of time in front of a mirror. “Oh, what’s that color? Where did you get that? I want one of those!” It’s what women do. Women share the wealth. And we’ve spent a lifetime doing that. And finally we thought, “You know what, we seem to know a lot about things that people don’t seem to really know about.” And so that’s what it was. It was fun, fun to put it down on paper, and it was a labor of love. CE: One of the things I like about the book is that the advice and tips you give are good for twentysomethings, thirtysomethings, fortysomethings and beyond. Was that a goal of yours, to reach out to many age groups, or did you have a specific group in mind when you set out to write this book? 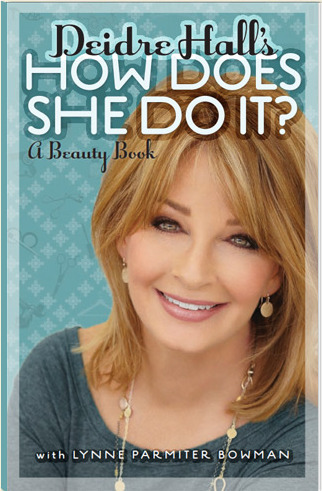 DH: Part of our conversation in writing the book was saying there’s nothing for women over 50 out there! They care! We all care! Why are there not beauty secrets for women who have sagging skin and lined skin and dry skin and that sort of thing? We wanted to make sure that that was also included in what we wrote. CE: I know some people, myself not included, are critical of plastic surgery, saying that it’s “cheating” in some way. What are your thoughts on plastic surgery? DH: I love it! I love that we have an option of changing the way we look if it makes us feel better. And it’s just as simple as that. There’s no judgment on it. There is no criticism of it. It’s a wonderful option for people who want to take it. The No. 1 surgery in this country is breast augmentation. Women spend more on that than any other surgery combined. CE: While this is a beauty book, it’s also a good self-esteem booster for women, kind of empowering. Was that one of your intentions when you were writing it? DH: We didn’t set out to change women. We just set out to sit down with them and say: “Honey, come here. I want to share something with you.” Wow, that’s a complicated question. We know that women at their very core like to share the neat stuff. So, that’s what we meant to do. Just share with women everywhere the things we’ve learned over many years.